Benchmarks compare the Odroid-C2. Pine A64+ and Raspberry Pis 2 and 3. 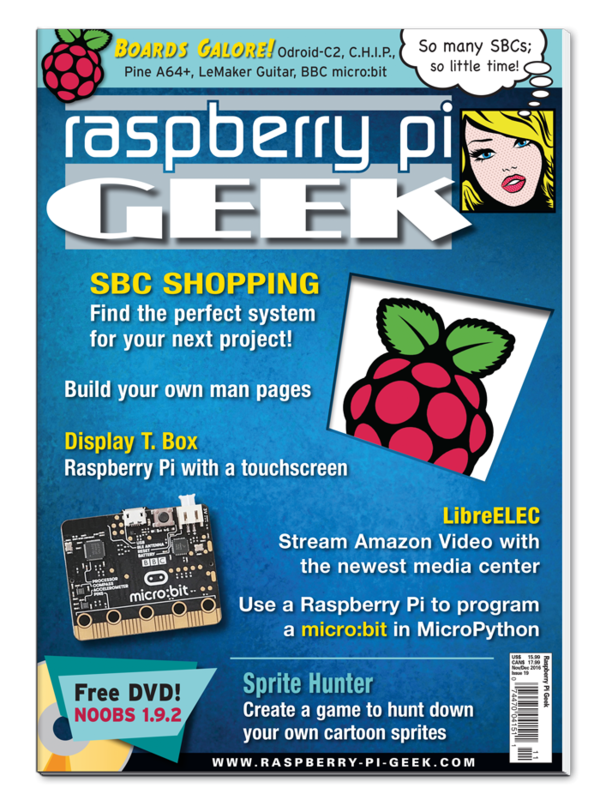 Hobby computers that challenge the Raspberry Pi 3. Don’t let appearances fool you: The C.H.I.P. computer is quite the beast deep down, and you can squeeze some seriously fun projects out of it. This tiny single-board computer from the BBC can be used both as an alternative and as a handy companion to the Raspberry Pi. This new media center allows you to stream Amazon Video. The pi-top turns a Raspberry Pi into a laptop with a high-resolution display and long battery run time. We show you three different ways to add your Raspberry Pi 3 to a wireless network. We explain how man pages are organized so you can get the most out of them. This project explores synchronization and randomness to create a sprite hunting game in Scratch à la Pokémon Go. Create a Lego Mindstorms NXT tramway and control it remotely with an Android phone app written in the MIT App Inventor web app.